May 08, 2018, 3:30 p.m.
May 8 marks Victory in Europe Day, commonly known as VE Day, which marks the surrender of Germany to the Allied Forces in World War II. 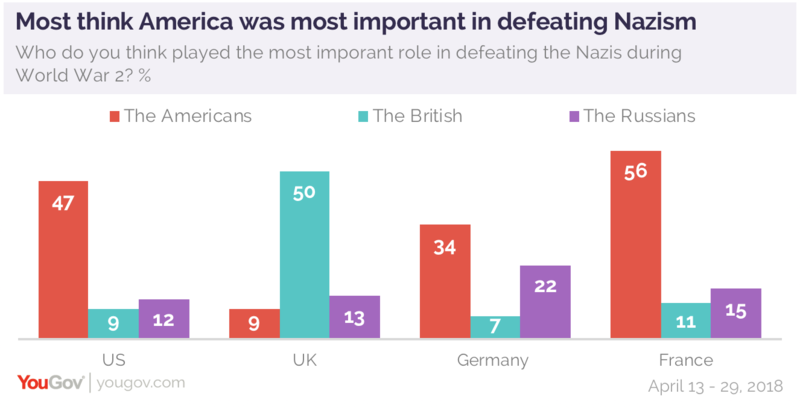 In anticipation, YouGov asked citizens from four countries deeply involved in the European theater of WWII (the UK, France, Germany, and the US) who they thought was most responsible for defeating the Nazis – the Americans, the British, or the Russians. Those in the UK were the only country who choose the British; the other three were most likely to choose the Americans. Amongst Americans, men were more likely to choose the US than woman, 55% to 41%. 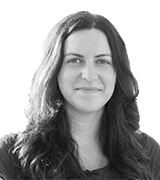 Women were less likely overall to have an opinion – 40% said they didn’t know. A certainly in America’s pivotal role rose with age; 62% of Americans 55 and over said the US had the most important role, while only 29% of those between 18-24 say the same. The British seem to hold a similar sense of home-grown pride – 50% of Britons feel that the British had the most important role, with only 9% ceding to the Americans and 13% to the Russians. The French are the most likely to believe that the US should get the most credit – 56% of the French say the Americans were the most important. 11% give credit to the British, while 15% give to the Russians. The Germans are the most split on the issue. While just over a third (34%) believe the Americans had the most important role, 22% say the Russians were the most crucial. Just 7% credit the British. See the results for: USA, Britain, Germany, France.